Sheet pan meals are all the rage right now, and for good reason. You get an entire meal, on one pan, ready in 30 minutes or less. 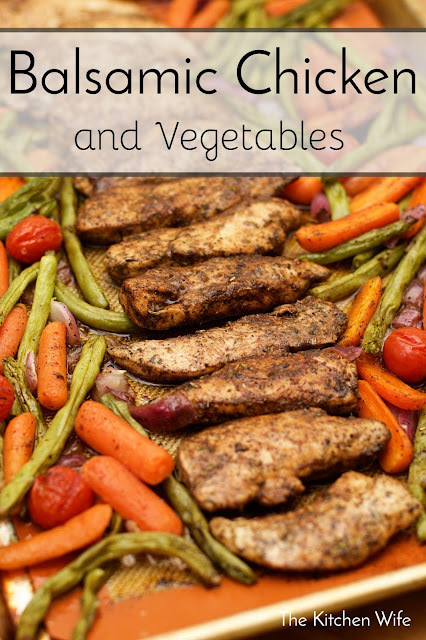 I'm definitely a fan, and one of my favorite sheet pan meals to make is this Balsamic Chicken and Vegetables Recipe. To begin you will need to make your marinade. Next add the organic stevia. You can also use honey or even sugar here, but I have been trying to watch my sugar so stevia is it. Place the lid on the jar and give it a good shake. If you are using a mixing bowl, whisk it all together until smooth. Now you will need to trim the tendons and undesirable bits from your chicken tenderloins. Place them into a large resealable bag and pour half of the marinade over them. Press all of the air out of the bag, seal it, and place in the refrigerator for at least 30 minutes. However, you will be happy to know that you can let this marinade overnight as well. While the chicken is marinating you will need to preheat the oven to 400. While the oven is preheating you can trim the ends off of your green beans, chop the onion, and cut the thicker carrots in half. This was my choice of vegetables, but you could use broccoli, cauliflower, asparagus, any kind of vegetable you like really. Next place the vegetables on a lined baking sheet, drizzle with a little extra virgin olive oil, and season with salt and pepper. Just in case you are wondering I love using the Nordic Ware Natural Aluminum Commercial Bakers Half Sheet. To line the baking sheet I really, REALLY love using Silicone Baking Mats. They are non-stick, reusable, and so easy to clean up. Once the oven has heated up to 400 degrees, place the pan of vegetables into the oven, and let it cook for 15 minutes. After 15 minutes, remove the tray from the oven and push the vegetables to either side of the baking sheet. Now you can place your marinated chicken in the middle of the baking sheet, in a single line. 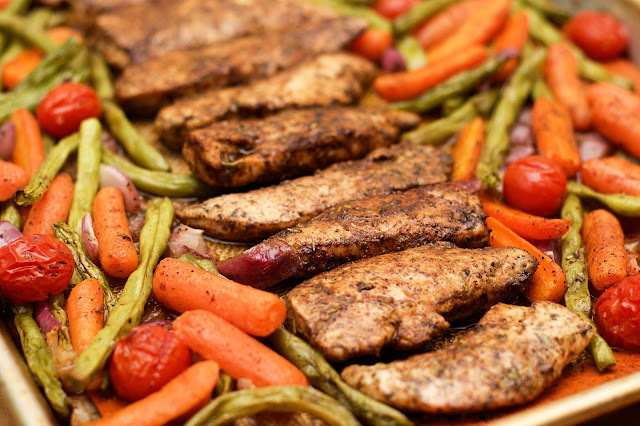 Brush the chicken and vegetables with the rest of the marinade. Then return the baking sheet to the oven and cook for another 15 minutes. And there you have it! A gorgeous sheet pan meal of Balsamic Chicken and Vegetables. The zesty marinade sweetens in the oven, creating a flavor that is just out of this world. In a mason jar or mixing bowl combine the oil, vinegar, Italian seasoning, onion powder, garlic powder, stevia (or other sweetener), salt, and pepper. Place the lid on the jar and shake. If using a bowl whisk together until smooth. Trim the tendons and undesirable bits from the chicken and place in a large resealable bag. Pour half of the marinade over the chicken, press the air out, seal, and place in the refrigerator for 30 minutes to overnight. Prepare the vegetables by trimming the ends off the green beans, chopping the onion, and cutting the thicker carrots in half. Once the oven is heated to 400 degrees place the vegetables on a lined baking sheet. Drizzle with a little olive oil and season with salt and pepper. After 15 minutes, remove the baking sheet from the oven, move the vegetables along either side of the baking sheet, and place the chicken down the center of the baking sheet. Brush the chicken and vegetable with the rest of the marinade and return to the oven for 15 more minutes. My mouth is watering!! Bob and I started today on really being serious with eating better and one of the things that came to mind was some of your one pan meals!!! 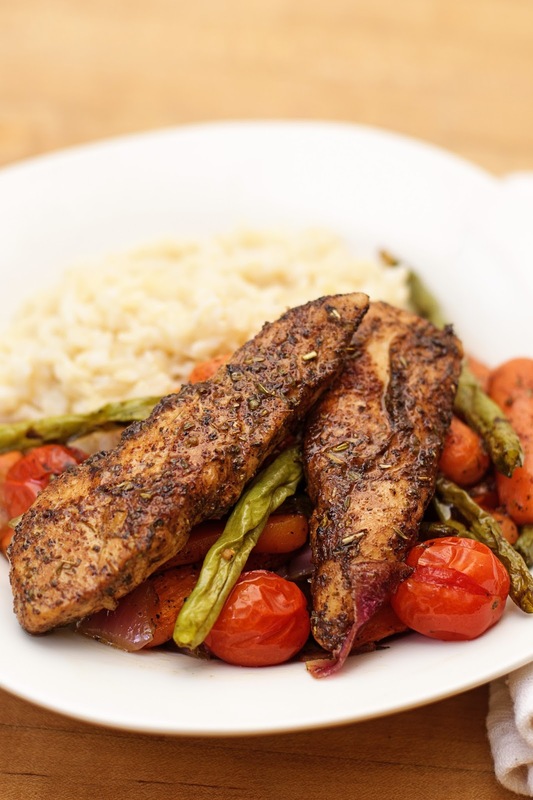 We love balsamic chicken. Will make for sure. Your photography is amazing! !